Downtown New Baltimore was laden with shuttered storefronts when Lee Miller came to the city nearly five years ago. Since then, he says it’s gotten a complete facelift with the arrival of new businesses and apartments and more mixed-use developments on the way. “It’s really starting to thrive,” says Miller, the city’s parks and recreation director. If a storefront is vacant, it’s because it’s being redeveloped, says Bobby Higgins, who opened Fin’s Eatery and Spirits downtown with his wife last summer. 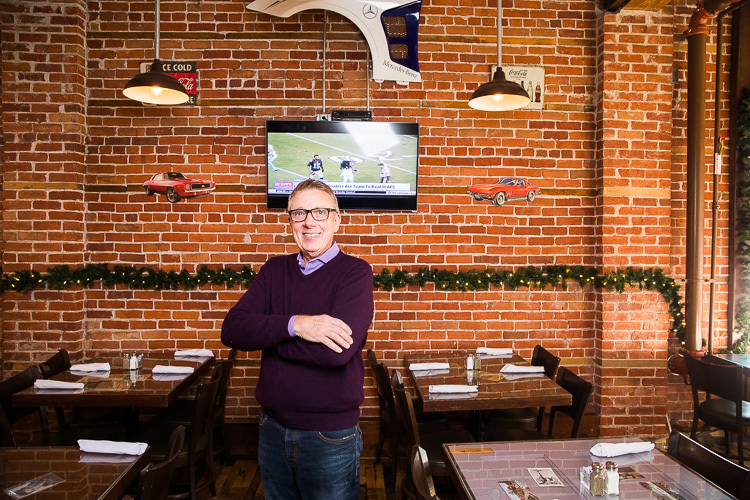 Higgins was a longtime restauranteur in Royal Oak but left in search of a smaller town. He fell in love with New Baltimore and especially its people, who he describes as courteous, friendly and willing to work together. Bobby Higgins. Photo by David Lewinski. 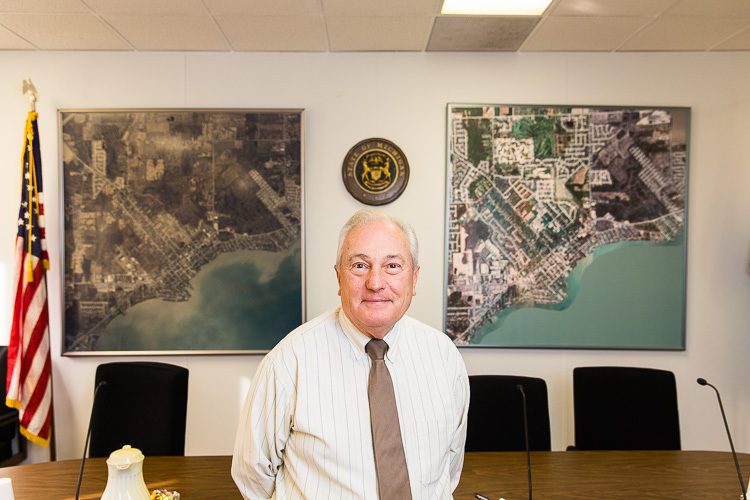 “The city’s unbelievable, and I know it’s just going to start growing now,” Higgins says. New Baltimore is a city of about 13,000 located in Macomb County on Lake St. Clair’s Anchor Bay. It was incorporated as a village in 1867 and became a city in 1931. In its early days, the village was a port and a manufacturing town, and in the late 1800s and early 1900s served as a tourist destination for Metro Detroiters. The city is now a bedroom community with a small industrial area and numerous residential subdivisions. While it’s no longer a resort town like it was 100 years ago, it appears the city is once again becoming a destination. “We are seeing more and more people coming from outside the city to visit, to see our restaurants, to shop in our shops in the downtown area, to go to our beach, to enjoy the fishing pier, to come by boat,” says Mayor John Dupray. Mayor John Dupray. Photo by David Lewinski. That momentum is aided by the opening of several new businesses in the last few years, including Fin’s, a frozen yogurt place and trendy boutiques, among others. The city is seeking developers to construct multifunction buildings with commercial and residential space on vacant properties it owns downtown. Local business leaders recently formed an organization for retail and restaurant owners. They hosted their first big event in November, a deer widow’s night out that brought hundreds of women downtown on opening day of deer hunting season. Fin’s owner Higgins hosts classic car nights on Mondays and bike nights on Tuesdays. A runners’ club makes its way through downtown on Thursdays. Just one block from Main Street lies Anchor Bay and a public beach with a park and day docks. The city has obtained grant funding to acquire the privately-owned Schmid Marina and turn it into a public marina facility that will allow boats to dock overnight. 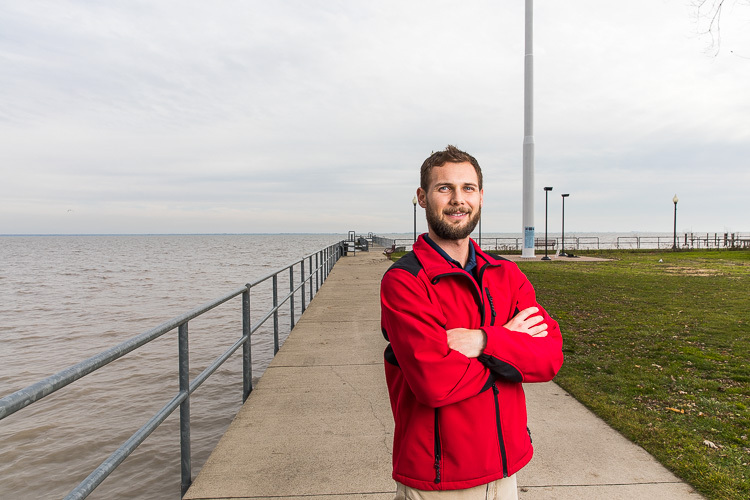 That project would open up nine acres of waterfront to public use and could turn it into a “big hotspot,” says Gerard Santoro, program manager for Macomb County’s land and water resources group. The city has been very progressive in its development, incorporating sustainability measures and ensuring new projects are done on a scale that keeps them quaint yet purposeful, Santoro says. “It’s hard to believe it hasn’t been rediscovered in a big way until more recently,” he says, noting the city’s historic downtown that offers a walkable district, housing, restaurants and new developments on the waterfront. Like other Michigan cities, New Baltimore suffered a decrease in taxes and state revenue sharing during the recession, but the city fared better than others since it was one of the fastest growing communities from around 2000 through 2010, Dupray says. While property values were declining, the city still benefited from the influx of new taxpayers. New home construction continues, though space is quickly running out. The city’s concentration of single-family housing could pose a challenge as demographic shifts create the need for more condominiums, multigenerational housing and transitional housing for empty nesters and senior citizens, says Santoro. Some people may have to move out of the city to find appropriate housing options, he says. In 2014, New Baltimore was ranked the number one place for homeownership in Michigan by Nerdwallet.com. The ranking was based on housing availability, affordability and population growth in places with at least 10,000 residents. In 2015, the website ranked New Baltimore as the fifth best city for young families in Michigan, citing its waterfront, downtown, economic growth and community involvement with groups like Bay-Rama. In recent years, it also has been ranked among the safest cities in not only Michigan but also the country. “It’s a very family-oriented, tight-knit community,” says Miller. Lee Miller. Photo by David Lewinski. He describes New Baltimore as a city of festivals. Any time of year, he says, there’s always some large event or special activity happening. The largest is the FishFly Festival, operated for more than 50 years by the nonprofit Bay-Rama. The volunteer-run organization has provided more than $2 million to the community through scholarships, community events and other donations, including Festival Park and the land used for the city’s beach and playground. Another volunteer organization, the New Baltimore Lions Club, raised money to erect a 160-foot flagpole — the state’s largest — on the bay to serve as a landmark for boaters after the historic water tower was removed. It was unveiled in October. Local officials are big fans of placemaking, an approach that guides the way they promote, protect and develop city assets like its waterfront, historic downtown, farmer’s market and festivals to make the city a destination for both residents and visitors. “Our goal is to make this a walkable place where people want to come, and they can live, work, dine, recreate and shop all in the same place, in a small friendly downtown area,” Dupray says. Since the city doesn’t have many large employers, it serves as more of a commuter community. Next year marks the city’s 150th anniversary, so residents and visitors should expect more events and activities in celebration of the milestone. All photos by David Lewinski.